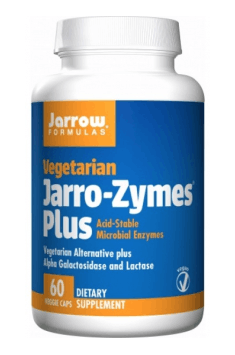 Jarrow Formulas Jarro-Zymes Plus is an advanced dietary supplement containing a set of digestive enzymes with the activity similar to pancreatic enzymes, stable in diversified pH of the digestive system. The preparation contains amylase, lipase, the complex of endo- and exoproteases, α-galactosidase and lactase, which facilitates digestion of milk products. The product contains 60 capsules appropriate for vegans and vegetarians. Enzymes, which break down food to the substances nutritious for our organism are essential for proper digestive processes. Optimal digestive processes influence proper absorption of amino acids, glucose and fatty acids, essential for many biochemical reactions. Deficiency of digestive enzymes may result in indigestion, digestive discomfort - heartburn, bloating, stomachache; disorders of bacterial flora balance, increase of body mass and energy drop. Complementing the level of endogenous digestive enzymes unburdens the digestive system, optimizes digestive processes and absorption and may reduce the symptoms related to food intolerance and allergies to i.a. lactose, gluten or legumes. Lactase is an enzyme with the activity of β-galactosidase, breaking down lactose (milk sugar) to glucose and galactose. It is naturally produced by cells present in the small intestine, however, with age, its activity drops, as after the period of infancy, milk is no longer a basic food source for a human being. In the lack of lactase synthesis, undigested lactose moves to the large intestine, where it undergoes bacterial fermentation to organic acids and gases, causing digestive discomfort after the intake of milk products. Osmotic pressure increased by lactose causes the inflow of water to the intestine and results in diarrhea. Amylase is a group of hydrolytic enzymes present in saliva and pancreatic juice, catalyzing the reaction of amylolysis. As a result of hydrolysis of α-1,4-glycosidic bonds present in starch, proper trioses and disaccharides are produced. Therefore, amylase facilitates digestion of products rich in starch - i.a. grains and legumes. α-galactosidase takes part in digestion of complex carbohydrates and facilitates their absorption. By facilitating the breakdown of heavy carbohydrates in legumes, this enzyme reduces digestive discomfort related to their intake. Lipase is a group of hydrolytic enzymes, responsible for the breakdown of esters of fatty acids to monoacylglycerol and free fatty acids, which are absorbed in the intestines, constituting substrates to metabolic reactions taking place in the organism. Moreover, lipase is successfully used in the therapy of steatorrhea. Proteases and peptidases are enzymes breaking down peptide bonds in proteins, conditioning their digestion. Due to the position of the hydrolyzed bond in the peptide chain, endo- and exopeptidases can be distinguished. Amino acids which are produced as a result of the breakdown of proteins take part in many important biochemical reactions in the organism, constituting i.a. a building material for connective tissue and substrates for the synthesis of neurotransmitters, hormones and enzymes. Proteases and peptidases may accelerate digestion and limit undesirable reactions to gluten, casein or animal protein. To sum up, Jarrow Formulas Jarro-Zymes is a complex preparation, especially recommended in digestive problems, during the intake of heavy or highly processed meals, in travel, in allergies and food intolerance and for people who lead a stressful and intensive lifestyle. Take 1 capsule with each meal or as directed by your qualified healthcare professional. Do not chew this product. Swallow quickly with adequate liquid. In order to support the organism in digestion even more, improve the assimilability of nutrients and reduce digestive problems, it is worth implementing an appropriate probiotic preparation. Probiotic bacteria contained in the preparation effectively help to restore bacterial flora of the intestines, essential for the proper course of digestion and absorption. Magnesium stearate (vegetable source), silicon dioxide, cellulose, rice bran and medium chain triglycerides. Capsule consists of hydroxypropylmethylcellulose. Bioavailable and well-tolerated forms of trace minerals. Iron-free. Probiotic dietary supplement in the form of chewable tablets. Helps maintain balanced intestinal microflora. Vitamin C in the form of ascorbic acid. It supports proper work and functioning of the immune system. Enzyme blend contains a selected set of digestive enzymes of plant origin, such as bromelain present in fresh pineapple, papain (papaya leaves and fruit); amylase and lactase (the digestive enzymes of carbohydrate), lipases (digestive enzymes of fat) and cellulase (decomposing in the body of an unfortunate cellulose), facilitating digestion and absorption of nutrients (sugars, proteins, fats). Particularly useful when using high-calorie diet and after workout, to facilitate the digestion of protein. Enzyme blend is a component OrangeOxiMega Combo Greens & Fish Oil, a complex supplement of Controlled Labs. Amylase (diastase), belong to the group of digestive enzymes (from the group of hydrolases) that catalyse the decomposition of polysaccharides (starch and glycogen) into simple sugars. They are found in saliva, pancreatic juice secreted into the small intestine continuing the digestion. In nature, found in malt, cereal grains. Included in the dietary supplement in combination with the components decomposing milk sugar (lactose), lipases (enzymes that catalyse the hydrolysis decomposition of an ester bond of fat) and proteases (enzymes that catalyse the decomposition of peptide bonds, and are involved in the digestion of protein). Products containing lipase are recommended for active people using high carbohydrate diet and eating hearty meals.